There's conflicting information on the web as to whether this came out before or after Queens of the Stone Age, and though I'm actually inclined to believe that it was released previous to their debut, I somehow didn't put that together yesterday, so it's here today. If it is chronologically off, it's not by much. So there you go. Not a ton to say about this one, though. The Queens songs are "The Bronze," a badass three-and-a-half minute rocker that would have fit in perfectly on their debut, and the wonderfully titled "These Aren't the Droids You're Looking For," a loopy instrumental that gets a little nutso in parts, but mostly sounds like a slightly refined jam. Cool song, though. 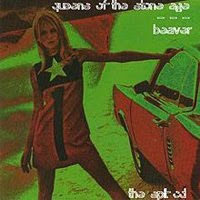 The two Beaver songs make nice companions for the Queens tracks, as they're equally thick and a little more sprawling. Also: came across an article that was published today, featuring Josh Homme talking about what went into Queens of the Stone Age. Good read. Check it out.